Mutations in the transcription factor STAT6 may result in disease. For example, STAT6 is associated with asthma development. Furthermore, STAT6 is constitutively active in many types of cancers. Thus, targeting the functioning of STAT6 is an attractive therapy for many diseases. STAT6 is a homodimer (composed of two identical ), capable of binding DNA when phosphorylated. STAT6 is made up of : the N-terminal coiled coil domain (residues 130-274), the DNA binding domain (DBD) (274-443), the Linker domain (443-536), the SH2 domain (536-626), and the C-terminal phosphotyrosine tail segment (626-651). How does STAT6 form a homodimer? Phosphorylation of the residue occurs at the phosphotyrosine tail segment of both monomers. The amino acids in the phosphotyrosine tail segments interact with the amino acids in the SH2 domain of the adjacent monomer via hydrogen bonds ; the hydrogen bonds hold two identical STAT6 monomers together, forming the STAT6 homodimer. Dimerization of phosphorylated STAT6 forms an . The structure of STAT6 differs slightly from other STAT homodimers. The STAT6 (aa 609-620) of the SH2 domains are shorter than the STAT1 and STAT3 C-terminal loops. This causes an to form above the antiparallel beta-sheet. Furthermore, the four of the STAT6 coiled coil domain are shorter than the corresponding regions in STAT1, STAT3, and STAT 5a. Only phosphorylated STAT6 forms a homodimer capable of DNA binding. 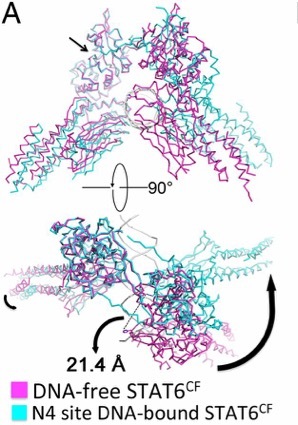 Dimerization of phosphorylated STAT6 forms the antiparallel beta-sheet. Two located on the antiparallel beta-sheet serve as hinge axis points around which the two molecules of STAT6 rotate when the dimer binds to DNA. Truncations of STAT6 before lose the ability to bind DNA due to the loss of intermolecular interactions of the antiparallel beta-sheet and phosphorylated tail segments, and thus, reduced dimerization. How does the STAT6 transcription factor locate its target genes? Conserved DNA motifs are found in the region of STAT6 target genes. STATs recognize a DNA motif (5'-TTCN3/4GAA-3’ ) with conserved palindromic bases (TTC/GAA) seperated by a spacer consisting of 3 (N3) or 4 (N4) nucleotides of any of the four nucleotides found in DNA. STAT6 is the only STAT protein that prefers binding to DNA motifs with a N4 spacer. One STAT6 homodimer binds a palindromic DNA motif. Each monomer binds half of the palindromic sequence. Residues at in the DBD participate in the recognition and binding of the palindromic DNA motif. The residues in the DBD bind DNA via hydrogen bonds with the DNA backbone . is the only residue that forms hydrogen bonds with a DNA base--the O6 of guanine at position 14 in the N4 DNA motif. H415 is oriented outward from the STAT6 homodimer, and thus available for DNA binding. Li et al. (2016) confirm that H415 has an important role in recognizing DNA motifs with a N4 spacer. Mutations of H415 decreased STAT6's binding affinnity to 5'-TTCN4GAA-3’ and increased STAT6's binding affinity for 5'-TTCN3GAA-3’. Rawlings JS, Rosler KM, Harrison DA. (2004). The JAK/STAT signaling pathway. Journal of Cell Science. 117: 1281-1283. “STAT6 Gene (Protein Coding).” Gene Cards Suite, Gene Cards Human Gene Database, 3 Dec. 2017, www.genecards.org/cgi-bin/carddisp.pl?gene=STAT6. Wills-Karp M and Finkelman FD. (2008). 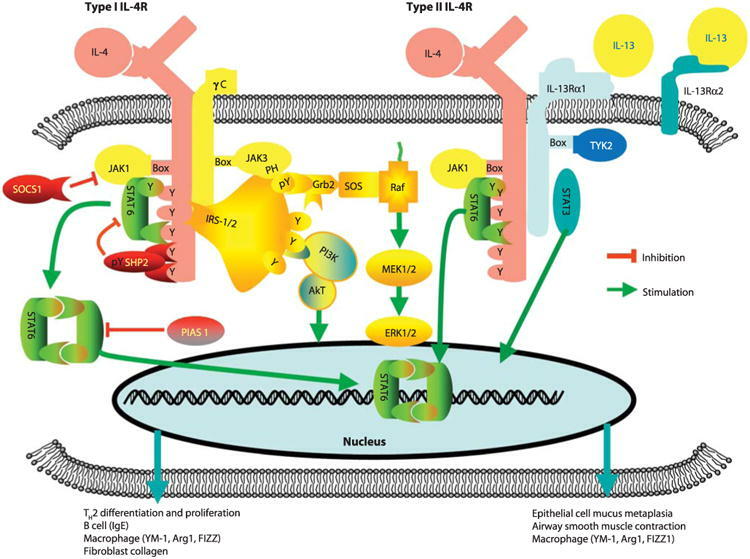 Untangling the Complex Web of IL-4 and IL-13 Mediated Signaling Pathways. Science Signaling. 1 (51): pe55. Li J, Rodriguez JP, Niu F, Pu M, Wang J, Hung LW, Shao Q, Zhu Y, Ding W, Liu Y, Da Y, Yao Z, Yang J, Zhao Y, Wei GH, Cheng G, Liu ZJ, Ouyang S. (2016) Structural basis for DNA recognition by STAT6. PNAS. 113 (46): 13015-13020.